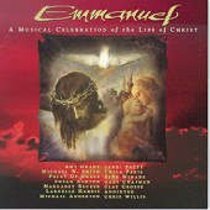 EMMANUELVariousThis musical celebration of the life of Christ features a whos who ofChristian music artists including - Susan Ashton, Margaret Becker, GaryChapman, Amy Grant, Twila Paris, Sandi Patty, Point of Grace, MichaelW Smith, BeBe Winans, and others. This spectacular production is anideal gift for the season. From Sparrow.